Rant(ish): Don’t Tell Me I’m Doing Too Much with My IVDD Dog! You are here: Home / Dachshund Health / Rant(ish): Don’t Tell Me I’m Doing Too Much with My IVDD Dog! I’m really trying to be nice and patient about this. I keep telling myself that people “educating” and “warning” me about Intervertebral Disc Disease (IVDD) are doing so because they care about Gretel. They care about us. I should appreciate that. Honestly though, my blood is starting to boil. I don’t expect everyone to know this but I am highly educated about IVDD. I’ve had over 5 years of experience with it. Between my experiences watching and listening to members of the Dachshund club I run go through it, and helping to rehabilitate my dog walking clients that had surgery, I’ve seen close to 50 different cases. That’s more than most people will see in their lifetime. I am a scientist by training, and I am passionate about Dachshunds, so I have researched about IVDD for years. I’m up on the current information about the disease and treatment. I have written several articles in an attempt to share my knowledge with others like The Truth About Dachshunds Back Problems and Do You Need to Treat Your IVDD Dog Like Breakable Glass? At the risk of sounding full of myself, I believe my knowledge level is not too far behind the kind folks at K9BackPack and Dodgerslist (I’m not a veterinarian but neither are the highly educated people that created those super great resources). Please understand the place where I am coming from when I say a lot of people don’t know what they are talking about when they give advice on IVDD. I don’t mean that the advice they are giving in wrong. What I mean is that a lot of the information people are trying to push on me is outdated. The rehab vet Gretel is seeing – Dr. Leslie Eide – is one of the top in the country. 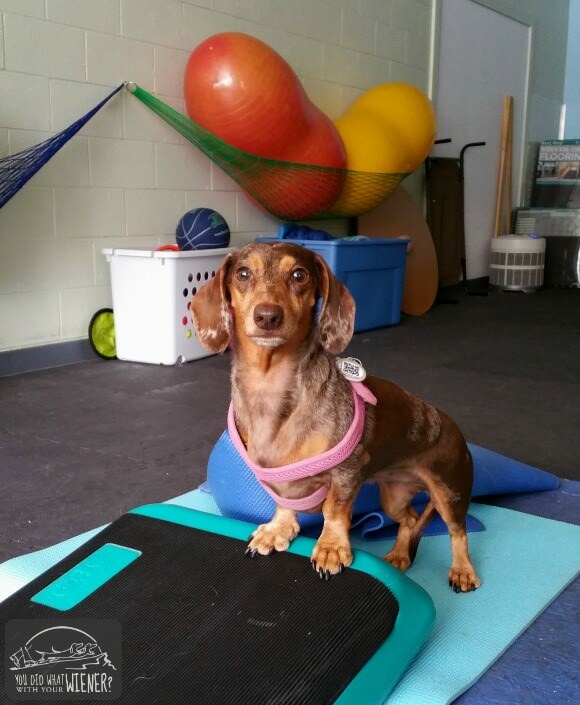 She helped develop dog rehab equipment like the FITbone (affiliate link) and travels the world teaching other rehab specialists the latest and greatest science and exercises. She is a trusted expert in her field and she knows what she is talking about. [youtube https://www.youtube.com/watch?v=Kr6gkkEtMDE]I have discussed pretty much every treatment option available, and the latest science, for IVDD with her. She believes, like doctors have realized with people in recent years, that ACTIVE recovery is best for the patient. The concept of making a person lay around for weeks to heal is old and antiquated. Todays goal is to get people up and moving as soon as possible so that they don’t lose the strength, health, and vitaility that they had before the injury (and to improve on it). This philosophy has trickled down to the way that animals are rehabbed after injury. So many people believe, and so much of the information out there on the internet supports, the philosophy that keeping a Dachshund with IVDD from being active is the best thing to do. The information stresses again and again that “strict” crate rest, where an animal is practically IMMOBILE for most of 6 – 8 weeks, is imperative for proper recovery. Well, guess what? Stuff posted on the internet lives forever. Much of the information out there was written years ago. People who write and share new information often rely on these outdated resources because they are “known” and “safe” things to recommend. Well, I don’t like to live in the past. I’m what people call an “early adopter”. I want what is best for Gretel and, to me, that means the latest and greatest developments, practices and technologies available to treat IVDD. Those things in bold above? Those don’t happen by making a dog lay around and be sedentary. They take activity and controlled exercises to achieve. I’m not winging it guys. Everything you see me doing with Gretel – from gym exercise to therapies to returning to hiking – has been approved and recommended by our awesome rehab vet. Every dog is different so it’s important to do what is right for YOUR DOG but I am doing what is right for MINE. You’re pleas to “be careful”, whether you mean it or not, feel like a judgement to me – a statement of sorts that I should be sticking with the old ways of doing things and that I’m being reckless with Gretel’s heath. Look. I’m a good, smart person. You, our fans and readers, are good, smart people. I know in my head that everyone that comments means well and I appreciate that you care. I appreciate that you are willing to share your experiences and advice with me, a virtual stranger. It’s just very frustrating sometimes. Gretel is not just a dog. She’s my life both figuratively and literally. My business and “brand” was built on our adventures together and my love for her. She is my heart dog and my baby. I’ve never in my life loved a pet this much. It’s borderline inappropriate, really. Ha, ha. Gretel having IVDD is emotionally draining because it not only makes me sad but it threatens our life as we I know it. The life I’ve built with her. In my heart, the “condemning” or “warning” comments hurt because I KNOW I am taking advantage of the latest and best science and treatment to help her. I don’t like feeling like I’m being put into a “stone age” box of old, antiquated ideas about how to treat IVDD. I guess I just needed to vent to feel better. I don’t want to keep it inside and explode on someone. Sometimes I can’t help be a little snarky or abrupt in my replies to people though. If you feel some resistance from me, I ask that you please forgive me. I’m human. Kuddos to you. I never knew so much about IVDD until two weeks ago when my “Dodger” became paralyzed. I took him to the Vet and was given a glimmer of hope while giving him steroids, muscle relaxants and pain meds as some dogs dogs do respond. My baby was 14.5 years old and was probably in stage IV. I noticed that he had slowed down in the last couple of weeks but had no idea that he may have been suffering. I have such a hole in my heart and an emptiness in my home. What a shame that I did not get myself educated about this. I’m so sorry to hear about your loss of Dodger. Four or fourteen, it is always too soon. Blessings and fond memories for you as you grieve. I am so sorry to hear about Dodger. I am sure there is a weenie sized hole in your heart right now. Take care. I’m so sorry to hear that you’re still finding people saying this type of thing! I think it’s obvious from all of your posts that you’re making informed, research-based decisions to help Gretel heal and give her the highest quality of life possible. Keep up the great work! Well, thankfully no one has been intentionally rude. I can just feel, through their comments, that they think I am pushing to hard (an a few have even said so). I just want people to understand that I know what I’m doing and I’m trying to educate people that there is new way that things can be done. Every dog is different but I want to let people know what’s out there so they know the right questions to ask their vet. Go get ’em! Love ya! I am sure as a serial dachshund owner that I will have future experience with IVDD, especially since I have adopted my IVDD foster, Liam. 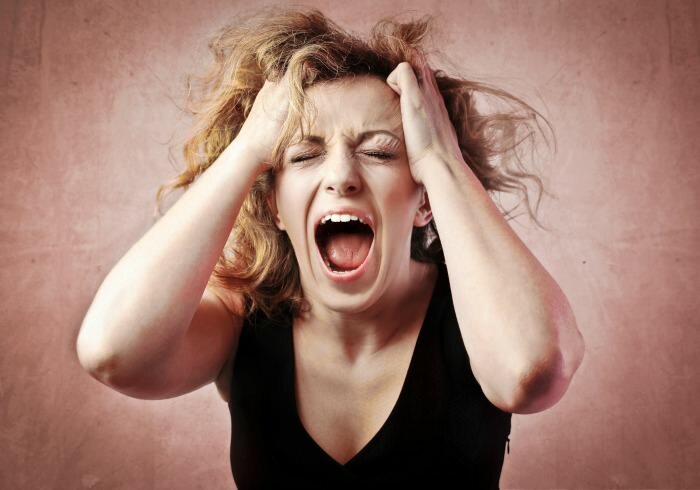 I was not prepared the first time the way I will be if an episode cones knocking again. I will be taking a page from your book and seeking out the latest and greatest in progressive treatment should I need it rather than jumping on the surgery bandwagon. Thank you so much for posting this “rant”. It is empowering for all of us who may follow with IVDD treatment. Surgery id definitely the right answer sometimes. It wasn’t recommended for Gretel or I would have done it. The treatment options after an injury, whether surgery was necessary or not, have changed though. I just want people to know that so they can ask the right questions. It’s clear to me though that some people think that the old way is the only way despite my efforts. Kudos to you for seeking out the latest and best veterinary care you can find! When something horrible happens to one of my dogs I don’t hesitate to go to the Oregon State University Veterinary Hospital. They have always been wonderful. I literally said, “TAKE MY MONEY!” To my vet. Ha, ha. I said, “whatever the latest and greatest is, let’s do that if it will help her get back to a normal life.” I’m glad to know the Oregon State University Veterinary Hospital is a great resource for IVDD treatment. The folks at OSU Vet Hospital saved my little dog’s life. She went down fast, and was completely paralyzed before and after the surgery. There was a wonderful intern that worked with her and recognized that after two weeks in the hospital she just needed to come home. I worked with her for months, and she can now walk. She never regained full control of bodily functions, but she lives to go on long walks. I know the walking is good for her, both mentally and physically! We are right behind you on our journey with IVDD. You and Gretel are our inspiration…I love all your research and the information you have available on your blog. You even messaged me privately to answer questions. Thank you for all you do! Glad I could help. In the end, that’s why I put all this effort into my blog. If I can even help one person… I hope that things go well for Hannah is on the mend and is able to get back to her adventures soon. In the long run, things like this are just a bump in the road. Us active humans sometimes have to deal with injury and move on too. You don’t need to explain yourself. Only you know all the facts … only you can make the best decision for your dog. Sometimes I already feel responsible when things go wrong (even though no one else would blame me) – because that’s your heart out there suffering and you can’t “fix” it. You question everything you did because you want to find a way to avoid whatever it is in the future (even when there’s absolutely nothing you could have done – it’s our need to feel in control and have things make sense). For instance, Bear Cat has a proclivity to dental problems. I brush his teeth every day, but he’s still lost about half his teeth, excluding the small front teeth and his fangs, which are all there. I’ve researched a lot and it’s so frustrating to see the cat/dog you love so much suffer and you can’t change it no matter what you know or how much you try. Good enough isn’t good enough when your heart, in the form of your furry friend, is hurting. A lot of people don’t put themselves in your shoes before they comment. They might have good intentions, but if they’d thought about how they’d feel to read that about their choices, they’d think twice. I’m sorry you have to deal with that. I know the anguish I feel at watching Bear in pain and it just makes everything worse to feel that people are judging you when you know you’re doing the best for the little furry guy or gal that you love most in the world. You don’t know me, but I’d love to meet in person at BlogPaws and give you a hug. It’s not so much about explaining myself as a defense as this post is about educating people. I think it’s necessary to explain where I am coming from and what I know in order for people to “get it”. My whole aim with this is to help people… to give them hope when so much of the information out there is doom and gloom. You are spot on with all of the feelings you expressed. That’s exactly where I am acting from and I know that others are as well. Our philosophies just don’t match up in some cases. That’s ok but it’s also ok for me to feel frustrated sometimes. Have you been to BlogPaws before? It’s a little nuts. I end up missing a connection with so many people I want to meet there. I would be happy to meet you in the lobby or cat lounge sometime to say hi though. It’s best if we pick a time before hand or tweet each other once we get to the conference though. My twitter handle is @YDWWYW. Thank you for your time and openness to share. We were bequeathed two mini doxies after a friend’s death. Sometimes we have no idea what to do with our doxies as we also have two golden retrievers. Your writings have helped us immensely. What you have been sharing is cutting edge treatment. We have adopted some of your suggestions. You always provide references and other sources for your treatments. Your contributions are indispensable. Thank you. Leslie. Living with canine epilepsy, I often get advice that is well meaning but often uninformed. My huMom & I try to be understanding & compassionate but some days are more difficult than others. I have learned so much from reading your articles! I cannot thank you enough for keeping us all informed. Two years ago our precious Tori became paralyzed on her right rear leg. When I took her to the vet I was astonished that she immediately suggested surgery. Needless to say, she is no longer our vet. From reading your blog and having done other research as well I knew that we should try something else first. Because it was all I knew at the time, I took her home and with crate rest, steroids, and muscle relaxers she bounced right back. You would never know this had happened to her now. I hope it never happens again, but if it does I will know there are more options out there because of you! Keep up the good work and know there are many of us that appreciate you and all that you do! Thanks. I’m glad things worked out for your baby. Surgery is often suggested when a dog becomes paralyzed. Gretel’s episode wasn’t that bad (only a little loss of feeling) so it wasn’t an option for her. If they had said she needed it, I would have done it in a heartbeat. Not everyone can afford surgery though. I’ve seen many dogs recover through medication, rest, and rehabilitation alone. Hopefully you won’t have to be faced with choices like that again. Hi! Our frenchie Mabel just suffered an IVDD episode. No paralysis but extreme pain. We had a MRI performed to make sure what we were dealing with. She had a herniated disc with significant compression in her neck. While still under anesthesia from the MRI, they performed surgery. She’s still at the hospital but doing well, walking and eating on her own. I’ve read so many gloom and doom stories, it was a breath of fresh air to come across your story of Gretel. I have so many questions. I know I need to be patient and let the vet address them when we come home. Do you think she will have significant crate restriction once she comes home? We are building ramps for the few steps we have, etc. Not sure this is necessary. Thanks for any insight!! Hi Mary. I’m sorry I couldn’t reply sooner. I’ve been sick. I hope surgery went well for Mabel. As your vet (hopefully) told you, crate rest is always imperative during recovery after surgery. I hope that is going well for you guys. It can be a challenge for sure but it’s so, so important to do it properly and for long enough. Gretel was on crate rest for 8 weeks! (she did not have surgery and we were extra cautious). As for the steps, that is up to you. For me, because Gretel is in shape and hikes, and knowing that she could get injured merely getting out of bed, I am not prohibiting her from using our stairs. Most people will shout, “no stairs, no stairs, no stairs!” but recommend stairs for a couch or bed in the same breath. Letting Gretel use the stairs is a risk but I don’t see it as any riskier than living life. Good luck to you and Mabel. Thank you Jessica! Mabel is doing well. We have her either resting in my husbands small office (with no furniture to jump on) or a crate set in her favorite spot in the living room. Once a day or so we take her on the deck for some sunlight (leashed). We are also taking her on walks 3x per day, as was suggested by our vet. They are sometimes a little longer than the vet said we should go, but we are almost 3 weeks removed from surgery. She still seems quite tired and not her spunky self. We see glimmers of her spunkiness before the episode happened but not very often. I’m thankful she never had any paralysis but I’m so nervous for the future. I’m sure we will get more information on how to proceed at the one month check up. What an emotional rollercoaster. Hope your Gretel is still doing well! Ugh… it certainly IS an emotional rollercoaster 🙁 I’m glad to see that things are looking up a bit but I understand still being nervous. Gretel’s back episode was two years ago. Although she is back to her normal activity levels, I am still a bit anxious about it happening again. It gets less but I don’t think it will ever go away. Good luck to you guys! I am looking for help for my darling baby daschund Winston. He is now 6 years old, he started keeping his head down a lot about two,weeks ago and would shiver sometimes and cry. The pain seems to be in his neck, he is being confined but poor guy looks st me like please get me out. It breaks my heart I feel so bad for him. The vet is saying he is having IVDD flare up. He seems to be a lot better the last couple of days we are not letting him have fill range of the back yard. Should I be massaging him everyday. Plus is there something we can do to,stimulate him he looks so bored. Have you ever used the Assisi loop or know of any people that have had success with it. But when he went last week he started getting aggravated in the car and was screaming in the vet so dr said it is stressing him too much and we should stop. I really need help with my little boy. Hi Janet. I apologize for taking so long to respond. I have written many blog posts about IVDD that answer some of your questions. Here is one on dealing with crate rest: https://youdidwhatwithyourweiner.com/dog-crate-rest-tips/. We did try the Assisi Loop and think it’s a great low-cost option. I ultimately decided to purchase a pet laser for home use. The articles related to that can also be found at the link above. Good luck to you guys. I know how upsetting it is to see your baby in pain.